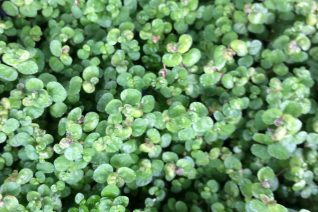 Baby’s Tears is a useful and surprisingly hardy small scale ground cover. Famous for its role in terrariums its surprisingly hardy to cold as well. Tiny leaves overlap in a perfectly flat deep green ground cover. Part shade to shade but not terrible dry shade or compacted soils. Spreads to several feet wide in several seasons. Rich, moisture retentive soil that drains is ideal. Mist or water once a week to increase humidity which it very much appreciates. Freezes to nothing below 15ºF- resprouts from bits of root vigorously in spring. Do not try to cover the whole planet with this diminuitive plant. Instead isolate it to cool pools of green several feet wide. Excellent in containers or as an easy houseplant.